Yet another beautiful day down the valley, with not a cloud in the sky. The trains were again extremely busy, being padded by visitors to the WyvernRail AGM and all strange quirks of the day were ably dealt with by our team. A well done to everybody who helped! Down the yard, work continued on the LMS brakevan and the 8F group were in action painting their van body and coach as well as working on the Austerity locomotive. A steady day with a predominantly male audience but still requiring a large contingent of volunteers to make it all happen. Special thanks to Matt who operated Gorsey Bank gates to speed the up steam services on their way and Rob in his first turn as supervisor of the Wash Green ground frame and yard manager. There was even more evidence that Duffield is becoming the main entry point to the Railway with many transfers from East Midlands Trains. The narrow gauge was in operations as was the EVRA shop. Further up the Yard was further progress with the LMS Brakevan. As ever, my thanks go to all who participated in the day and lent their hands to make it all work. As the fourth month of the year draws to a conclusion there is much to report again. Duffield has seen weed treatment applied to the staff car parking area and the cabin prepared for repainting. The lawns have been mowed as they rapidly approach the standard of Wimbledon. I have to admit the suggestion that we spend even more money on this area has turned out to be a very worth while decision! The VCT have achieved minor miracles with the removal of the banner at Duffield requiring death defying feats so that the developer can resume the marketing of the remaining three flats. Some effort has been put into reducing the fire risk between Duffield Tunnel and the A6 bridge but care will still have to be taken as we steam north. An overhanging tree near milepost 134 has been removed. Back at Wirksworth, Graham and Matt have checked the axle boxes of the "steam" set and oiled up where necessary. The brake rigging has also had oil applied and the leak in the SK's toilet has finally been fixed by John, our ace plumber. Komatsu maintenance was undertaken and Mike was very pleased with his experiment to reverse the turning of the flail. This will mean that the machine sends the cut material down rather than ahead much reducing the risk of collateral damage. A lone track patroller packed sleepers on the "racing" straight and replaced a sheared fishplate bolt south of Barnsley Lane. A cracked fishplate was discovered which will be changed next week and missing or mismatched clips were fitted or changed south of Idridgehay. Real Railway work! The recent observation of water leaking above Derby Road 1 bridge has now been tended to. Some photos taken by Neil and forwarded to Severn Trent Water seem to have caused the necessary action. 78019 was prepared for the next four days and a warming fire lighted. The pit was emptied of ash and the water tanks, now full, were placed in the correct position for the weekend. Another good and productive day. Tony organised a whole line patrol with great effect by allocating sections of the Railway to different small groups and it is pleasing that a pattern is emerging that will crack this onerous task off each two week period. Additionally a further five pairs of fishplates have been greased as we stride towards ensuring the whole line is so treated. Many thanks to all involved. Back at Wirksworth the "steam stock" had a thorough clean for the next four day weekend and many necessary tasks were achieved on the dmu fleet to ensure they can fulfil their role. The VCT Landrover returned from its routine service with its rail gear greased, body fluids replenished and a resolution of a defective passenger door lock. All it needs now is a good wash down! A complete change of gear as the work teams resumed activity with the PWT leading the way achieving the stubborn problem of the Idridgehay clamp plate, a temporary holding device when a fishplate cannot be fitted due to the gap being larger than that can be spanned by a normal fishplate, resolved by removing fishplates for five panels and creating even gaps to reduce the problem joint. The team then went on to grease 20 pairs of fishplates between Shottle and Hazelwood greatly reducing the areas remaining to be treated. The VCT followed the PWT and tackled a lot of felled timber by an adjacent "helpful" farmer between Barnsley Lane and Callow Park resulting in two large fires to burn the brash. Alan had a mile post day with attention given to 141 3/4, 140 1/4, 140 and 139 1/4 and there is nothing more satisfying than seeing the lineside furniture in good condition. The DST were also out in force and fitted the brake gear and sand boxes to Henry Ellison. This project comes on in leaps and bounds with the locomotive gently turning a tasteful shade of blue. Work continued on supplying sufficient water for our steam operations and the lone fishplate bolt fettler was in action. All the Wirksworth Ground Frames were serviced which included adjustment and oiling. Thanks to Richard Hatch for this valuable work. A special mention for John Stokes who spent the day cleaning the dmu fleet and restoring the door lock between the drivers cab and passenger saloon on the Class 117. Cleaning and presentation of the vehicles our passengers travel in is so important as we all remember experiences elsewhere if all was not as it should be but not when all was well. The Booking Hall waded through the bureaucracy necessary to adequately account to the spectacular sales over the past four days and continued to process encouraging forward bookings. We end our four day extravaganza somewhat exhausted but uplifted by the financial results which have helped, together with the previous activities post the Duffield opening, to secure the Railway's future. The energy put in by the large team involved in delivering the train services, maximising the revenue opportunities at Duffield, Wirksworth and on the trains, providing the Easter Egg hunt, running the narrow gauge and servicing the EVRA shop, Catering and the LMSCA stall has exceeded our wildest expectations. A very big thank you to all of you and all who wish the Railway well should echo this as it really requires doers to make it happen. We have it all to achieve over the next four day holiday and there remain very many positions uncovered. Please come on down, we need you. Slightly cooler today but still another barnstorming performance all round, with a little brake van grinding thrown in for good measure! Another magnificent day with everything working in harmony. Mary's Easter Egg hunt was popular, the LMSCA had new products for sale and the EVRA shop disposed of more material unique to that emporium. Our train services ran superbly, we are really getting much better at the pattern of services and the interchange between steam and dmu. A big thank you to all involved, and there are many, in making the second day of the holiday go so well. A wonderfully pleasant day free of any operational problems and a general feeling of wellbeing. I take the opportunity to thank everyone that actively participated and created a welcoming atmosphere for all our visitors at either end of the line. The Booking Hall and the equivalent at Duffield had a most successful day. The train crews performed perfectly and the Royal Saloon Attendant entertained his passengers. The Narrow Gauge was in action and the LMSCA stall had a steady successful trade. Our Bluebell Ground Frame supervisor orchestrated the interchange between steam and diesel with consummate ease. The tills were heard to ring in the EVRA shop although whistle sales can be a little wearing. Ice Cream sales were brisk and the Catering Operation is getting ever slicker. Dorothy met an urgent request for eggs for the next three days Easter Egg hunt and, as ever, we remain indebted for this emergency response. A most intensive day with so many activities to report on. So, off we go with the VCT venturing up the Incline felling one large tree that was threatening to impede the progress of our trains and one large fire to consume the brash from this and previously cut timber. ASM Woodhouse also had two fires to deal with brash accumulating from areas around the Car Park. We received a further load of coal and the flail was serviced. Much angst about water saw the tankers placed in the Car Park with the objective of completing the filling from the mains supply. John Allsop had a day of painting so that dmu W51360 has a smart yellow front end and the recently installed drop windows in the Saloon match the rest of the coach. All portable toilets at Wirksworth and Duffield have been valeted and Pat has been strimming the banks around the Wirksworth station site. 78019 has had further cleaning attention. Progress at Duffield has seen the completion of pointing up of the platform and the buffer stop has received its final coat of paint. We received a splendid boost from the Skipton Railway Study Group who sampled the first ever through train from Duffield to Ravenstor. They swelled the coffers of the Booking Hall, Buffet and EVRA shop. Another very pleasant day completed by an innocent enquiry about the building work opposite the station approach at Wirksworth. This apparently is to become a rest home and mortuary and we must welcome a market in future funeral trains! Perhaps they have been researching our average age. Greetings from Wirksworth sur Mer as the temperatures rise and the forecast for the Easter weekend looks unusually good. Today saw the weed control team setting out in the Multicar and the whole line has had its first dose of the year with many thanks to Richard and Tony. The PWT fitted around the weed control activities and returned to the Shottle Hazelwood section for further fishplate greasing. Some six pairs were achieved with some difficulty illustrating that this task may not have been carried out for a good many years. On return LJB shunted the water tankers to the car park so that they can be topped up by "town" water tomorrow. Unsung heroes of today were the carriage cleaners who concentrated on the "steam" set to ensure they are at their best for Easter. 78019 and No3 also received some cleaning attention and the station garden had further work as the Head of Gardening fought against drought conditions. A curtain was tastefully applied to the storage area in the Second Open of the Gatwick stock. The Booking Hall welcomed a number of visitors and progress more group bookings. The LMSCA accomplished the movement of their stand to a position in readiness for the weekend. A very pleasant and productive day. A most pleasant day with lots of productive work undertaken. The VCT departed first for Ken Rowland's and Callow Park to deal with pre cut vegetation and an overhanging tree of monstrous size. They managed three fires to consume brash and returned at a late hour to Wirksworth content with their achievements. The PWT attacked two specific tasks today the first of which was the curve at the south end of Bournebrook Avenue that has been the fairly constant source of track misalignment. This has been dealt with although further ballast will need to be dropped to stabilise the area.The second area to be tackled was the geometry at the base of the Incline, again a reliable source of problems which has now been brought back into some semblance of order pending some more major work later in the year. The DST continued in their quest to reassemble Henry Ellison and belts were replaced underneath dmu car 51360. The LMSCA turned their attention to blinds and tables for the Third Open and had a general tidy up of their premises. The Booking Hall finalised the accounts for last weekend for our bookkeeper and processed even more group and charter bookings. The quest for locomotive water continued and 78019 now has a filled tender to start the Easter weekend but work continues to fill our two tank wagons so that we survive through the four days. There are Network Rail engineering works on Sunday 24th (Easter Sunday) and Monday 25th (Easter Monday) at Ambergate affecting services between Derby and Matlock. This means that there will be no main line trains calling at Duffield during this time. If you plan to visit us arriving via the main line, East Midlands Trains will be operating a bus replacement service between Derby and Matlock which will call at Duffield, stopping on the main A6 outside the station. More information can be found on the National Rail Enquiries website by clicking here. We write to you from The Hair and Higham (a Marstons house), after informing their clientelle of the next departure, where we are quite exhausted and have RSI about counting notes! Another sunny and warm day that has probably, in many areas, broken our records. This was the first day of the regular timetable and fare structure and every service on the Duffield line, both steam and railcar, was packed to the ceiling panels. It was interesting to note the amount of people who were actually taking single journeys to Duffield and Idridgehay as an intermediate stop. Thank you to everybody who has helped out, you all deserve a long Radox! We welcomed the RAIB to a training day at Duffield with Mick Thomas hosting them and three participants in a Group Drive a Diesel Day guided by Lewis and Richard. The Group achieved some most useful shunting with the water tanks positioned for filling and surplus freight stock was stabled at Shottle to release more space at Wirksworth. The participants seemed to have enjoyed their day with us immensely. There was much dmu maintenance and re-formation of the sets for the weekend. It was good to see Mike Evans with a mop and bucket to deal with a toilet leak on the centre car. Who said preservation is glamorous? The Head of Gardening was present and the Booking Hall responded to an unending ringing of the phone indicating a particular interest in the weekend which I hope will translate into cash. Another varied and successful day. 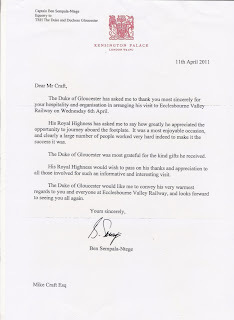 I attach a scan of a letter received from Kensington Palace that brings a warm glow. The rhythm of our normal week seems to be returning with the PWT departing for a further mile of track patrolling followed by a magnificent 14 pairs of fishplates greased which is quite remarkable as there was only three of them. Tony Watt also patrolled a missing section on the Idridgehay stretch leaving Old Lane to Postern Lodge to be viewed tomorrow. This process is showing signs of settling into the new pattern. The main problem seems to be trains running up and down causing wear and tear! At Wirksworth coal was moved from the Dust Dock to No3's storage area for the weekend and our ace plumber, John, managed to guide a solution to the water retention for the toilets in the SK and Saloon with Mike Craft acting as labourer. A customer was with us for a few hours testing a hand held rail flaw detector and it was good to see him return to the fold. Our work experience student from Anthony Gell School. Liam, has now stuffed and labelled all the envelopes with the Annual Accounts for shareholders. A job very well done. The VCT continued to respond to a number of outstanding tasks left for a while during the Duffield purge. Today's area was around Ken Rowlands crossing where there was a controlled gorse burn at the request of Ken and two large fires to burn pre-cut brash. Another remarkable achievement for the four man team. Duffield saw further pointing up of the platform wall with another 90 feet dealt with and Chris has commenced painting the buffer stop to Mick's predetermined specification. There is an incredibly encouraging torrent of group and charter bookings being very ably dealt with by Leigh in the Booking Hall which bodes very well for the year ahead. The last piece of good news today for those who had gathered and struggled to pack the scrap skip at Shottle that their efforts were worth it - £240 raised for the enterprise for what appeared to be a collection of wire, cable and sundry tat. Keep on collecting it up! A good and productive day. Another rather gentle day where track patrolling was the key element of the day after the sustained use of the whole line for five days opening excitements. The PWT divided into several teams and reported many fishplate bolts tightened and a number of small tasks logged for further attention. Almost the whole line was covered in detail with around one mile to be achieved before the weekend. The Komatsu was in action helping to improve water supplies for the steam locomotives and moving the flail head for maintenance. Carriage cleaning also featured today and further remedial work on the BSK. The Booking Hall received some group and charter bookings and envelopes were stuffed for the upcoming mailout of the Annual Accounts for shareholders. A strange atmosphere today as the opening and all its excitements were put behind us and there was a general return to the mundane, but essential, tasks before us. Encouragingly there was another very large turnout with a great deal of work in many departments resuming. The LMSCA organised the sealing of the lino in the Third Open and Alison gave the workshop a mega clean and the team were seen in a huddle as they wrestled with the design and costs of installing tables in the Third Open. In the SK, second corridor coach, further attempts were made to ensure the toilets function. Partial success was achieved last week but the water was leaking away quite quickly and this problem is now being addressed. The VCT were drawn back magnetically to Barnsley Lane bridge where the adjacent landowner had felled a number of trees that landed on railway property. This saga is set to run for some time and I thank the VCT for being measured in their response to a potentially difficult situation. The joys of managing a nine mile linear estate! The PWT resumed activities which involved the creation of more fishplate grease from our supply and managed some vital work in this area. The team emptied last week's collection of scrap into the skip at Shottle but I fear it contains more fresh air than value but I may be surprised. Logs were transported to Wirksworth and a wagon containing fence panels was shunted into a position that distances it from the Main Line. Shunting of stock at Wirksworth completed their quite long day. Part two of the PWT completed a track patrol from Wirksworth to Barnsley Lane and Part three filled the tank and mixed the Round Up solution for weed treatment in the near future. The DST strode forward with Henry Ellison with the connecting and coupling rods fitted and many parts painted as this locomotive rapidly approaches completion. A further 40 feet of Duffield platform was pointed up, a task I had certainly forgotten in the euphoria of the opening. Much thought and work has gone into improving the way we gather water and supply it to the locomotives with solutions emerging that will make this a much easier process. The Booking Hall was in full blast as the accounts for the weekend were concluded and the remaining cash banked. Very satisfying. I can only reiterate that after the high of the last week it is very gratifying that all the teams are getting back into their stride to tackle a large number of jobs left to be done to move us forward. Well, our five day extravaganza has been completed. It has been a very major success due to the diligence and enthusiasm of everyone involved including those who orchestrated the preparations beforehand together with the major press and PR offensive. All have learnt quickly from the experience given that we had never done anything like it before and there was little time and opportunity to practise. Three very loud cheers to all who actively participated and pulled off something we have never achieved before and unlikely to repeat again unless we acquire another branch line - now there's a thought! Another spectacular day with full trains and happy passengers. Through rail journeys were detected from Hove, Bangor and Lincoln boding well for the future. Again, great praise for the many that made the day happen throughout our network! Day one of our public opening days in glorious, warm sunshine saw the Railway in a festive atmosphere and many visitors from far and wide. These visitors together with a sprinkling of invited guests made the whole event go with some style. It was great to see a contingent from East Midlands Trains witnessing the large number of cross platform transfers at Duffield. The furthest travelled through rail passenger appeared to be from Southampton. We also welcomed the Mayor of Wirksworth who may have been impressed by the interest in our enterprise and the sheer number that combined the Railway with a visit to the Town. Perhaps Wirksworth will open on Sundays in future! Today and the weekend will stretch our volunteer team and I do thank everyone today for all their energy and enthusiasm. The wonderful by-product was that we actually took some serious money that is beginning the rebuild of our very depleted funds over the last couple of months. Well done everybody and I await the weekend with much anticipation. Quite a charming day after the excitements of yesterday where we welcomed our shareholders to the Railway after their generous contributions of capital that helped the whole project to move forward. The Railway buzzed and there was a fete atmosphere. It was good to meet so many supporters that were fulsome in their praise for what had been achieved. I have to report even amongst this joy Alan applied bridge numbers to Cemetery Lane and Cromford Road but also used the opportunity to take some special photos. The operation of two steam locomotives today has also given us more experience in this area and I am sure we will continue to learn over the next few days. Basking in the glow of the re-opening will last until Sunday and then we will return to some serious work that will continue to exercise our various teams. Meanwhile, please enjoy the sights and sounds of steam in the valley. Many thanks to everyone that participated in today's train operations and there is only three days to go! I can only report on a day that has been most excellent. All worked seamlessly and the Duke of Gloucester arrived off the 0925 St Pancras to Sheffield with a special stop at Duffield and progressed with us to Wirksworth. Our Royal Train, the first ever to Wirksworth, travelled with HRH on the footplate to Idridgehay and then he joined the Royal Saloon for the remainder of the journey. A tour of Wirksworth and meeting of school children and our working teams worked very well and the Duke proved to be a could communicator as he met a large number of people. After a lunch organised by Dorothy where chocolate cake featured he gave an impromptu speech that was quite entertaining and we bade our farewells. I can only express my admiration for all the volunteer teams that attended today's events and the whole operation went seamlessly and reflected immense credit on the whole enterprise. One could not imagine today's proceedings 10 years ago or even six months ago. Glasses should be raised more than once after today's events. I think today captivated the media and we should benefit immensely from the exposure achieved. There has been an air of quiet calm as the next day beckons. The PWT had a day of cleansing the line side with a mega wagon of logs delivered to Shottle together with a wagon containing a selection of hand trolleys. Some time was spent on a defective track joint at Idridgehay with some success but more work will be required after the grand opening. The VCT had another most productive with a further 50 yards of views opened up and two large fires to consume brash. Alan assisted with the markers at Gorsey Bank to indicate to the steam loco when the train is clear of the crossing gates. The DST have restored and fixed the back cab of Henry Ellison and more general work on the locomotive. There has been an inordinate amount of cleaning, painting, polishing, preparation and general anxiety which will all be worth while tomorrow and my thanks go out to everyone involved. The Booking Hall processed a late rush of bookings and sundry questions and enquiries. Tomorrow's report may be fairly rambling but I am sure you will all understand why. Just a reminder that pre-bookings for the Grand Opening Event have now finished. Tickets will be available at both stations on the day for any remaining seats that are not booked. A day of steady endeavour as the great day approaches. The Incline had the benefit of a track patrol that confirmed all was well for this week's activities. The LMSCA were out in force to wash the coach and deal with some last minute snagging. They were greatly aided by Lewis who responded to a short notice call to move the coaching stock to Platform 2 so Alison did not have to stand on tip toes with her brush. The Third Open now is clean on both sides. The owners of 78019 were present as part of the preparation for Wednesday and a steam test to take place tomorrow. Again, thanks to Lewis, the loco was moved to the coaling area and the tender filled up. Gary opened another tin of paint achieving a little more work on Platform 2 before his rainmaking skills caused the heavens to open again. His partner, Lynette, Head of Gardening, continued the Forth Bridge task on the station garden. A refugee from Devon was put to good use in cleaning the Road/Rail Landrover and the Komatsu. His dialect is difficult to understand but if you are patient there are number recycled jokes available. We welcome Phil back to the fold for our significant week. All the elements continue to come together including the fitting out of the Duffield Booking Office. PS - At the suggestion of 78019's owning group there will be opportunities for aspiring drivers to take the controls of the locomotive for £20 a throw with 50% going to the owners funds and 50% to us. There are a couple of windows each day the loco is rostered to run, accommodating about five trainees a day, from Friday 8th April to Sunday 22nd May. These will be sold through the Booking Hall at Wirksworth and may be one of those things you've always wanted to do? Just a reminder that pre-booking finishes for the Grand Opening Event tomorrow morning (Tuesday 5th April). Tickets pre-booked online will be available for collection on the day. Tickets will be available on the day however it is expected to be busy and seats are not guaranteed with these tickets. guests also gave us very fine feedback about their experience today. north end, though the grinder is still being applied to the south end. antimaccassars and cleaning to handrail fitting. way back from a mercy dash to Buxton with a supply of digestive biscuits. A beautiful warm and sunny day that saw many Day with a Driver guests get the full treatment from the team. Down the yard, the 8F group were in attendance and the DMU team completed many outstanding odd jobs on the newly arrived Class 101 vehicle. The day ended with the vehicle being joined up to the other two 101 vehicles to form the set for the opening weekend. Some more odd jobs are outstanding on this vehicle tomorrow. The rest of the set had an exterior wash. The LMSCA were in attendance doing some last minute finishing touches to allow their coach to form part of the steam set at the opening as well. The marquee was erected in the quadrangle at Wirksworth ready for the opening. The Booking Hall reported that it was inundated with telephone calls and enquiries about the opening, with some more late bookings being taken. If you haven't booked already, some of the services are getting pretty busy so we recommend logging onto the website and booking to guarantee yourself a seat! I am very pleased, and much relieved, to report that following today's visit from HMRI they were content that the physical work from Idridgehay to Duffield had been completed to a very high standard and all the supporting paperwork was in order. The appropriate documentation will now be issued in time for the Royal Opening on Wednesday 6th April. As you can imagine there has been an inordinate amount of back ground work to prepare for today's successful outcome by so many people. I was very ably supported today by Mike Evans, Graham Walker, Mick Thomas and Bob Swepstone and their input was invaluable. There were other tasks undertaken today including housekeeping in the Booking Hall, further work on the BSK and Lewis completed the sparkling of D8001. Please raise you glass to another most successful and rewarding day. PS I understand the Sultan has changed his mind! I am very pleased to announce after many many months of negotiations that the Sultan of Brunei has agreed to fund our reconnection to the national network, further refurbish the line to Shottle and install a number of facilities on the site of the Peak Oil operation including undercover storage of his own Royal Train to built locally in Derby. All this development is associated with the establishment of the Turnditch Stud Farm for which the majority of movements will be by rail to preserve the Sultan's green credentials. A warm welcome, I am sure, will be given to this most welcome and prestigious addition to our operations not to mention considerable revenue benefits accruing to the Company. Now, where are my tablets?